Nothing beats a good, old-fashioned end of year sales wrap-up. 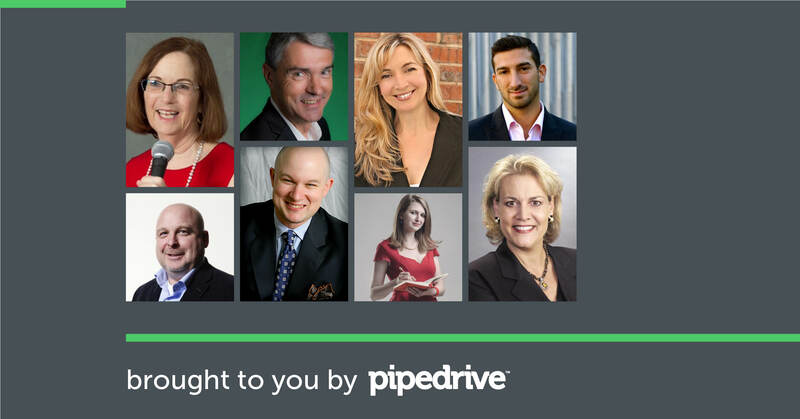 And today, Pipedrive is honored to bring together eight renowned sales leaders and to share their insights on the state of the sales industry with our customers and friends. We asked each expert what they thought was most notable in the wonderful world of sales in 2016 and what they expect to see more of in 2017. Whatever the technology, our experts caution that even the best sales tech must be backed by a solid sales strategy and can never be used to replace building good relationships between reps and prospects. This is good news for salespeople (who won’t be replaced by robots) and for customers (who likely prefer talking to a person rather than an AI assistant). It’s also potentially good news for sales organizations, as our experts predict organizations that prioritize communication will be successful. But it may not be as great for the creators of sales tech, who face increasing competition in an evolving and crowded marketplace. Read on to see what the experts have to say about the sales industry in 2016, and what we can expect to see in sales in 2017. 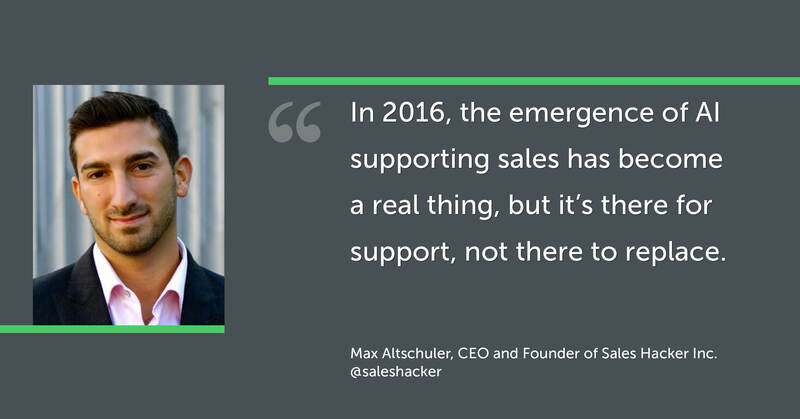 Max Altschuler, CEO and Founder of Sales Hacker, Inc.
What did you find most notable about the sales industry in 2016? Max: In 2016, the emergence of AI supporting sales has become a real thing, but it's there for support, not there to replace. I’m not quite sure if people understand that fully yet. The ones that get it, and do it right, will see the results. I'm excited about a few of the companies I've seen lately. Pipedrive: Where do you think the sales industry will be headed in 2017? Max: In 2017, I think we'll see more adoption of technology in the sales process but also a full circle of sorts. More and more people will emphasize phone training and direct mail and other ways to set themselves apart from the rest of the sales reps.
We are over-reliant on email because it's scalable and trackable, but other means will start to resurface again. I especially like the role of texting in the sales process and am interested to see where that goes. Pipedrive: What did you find most notable about the sales industry in 2016? 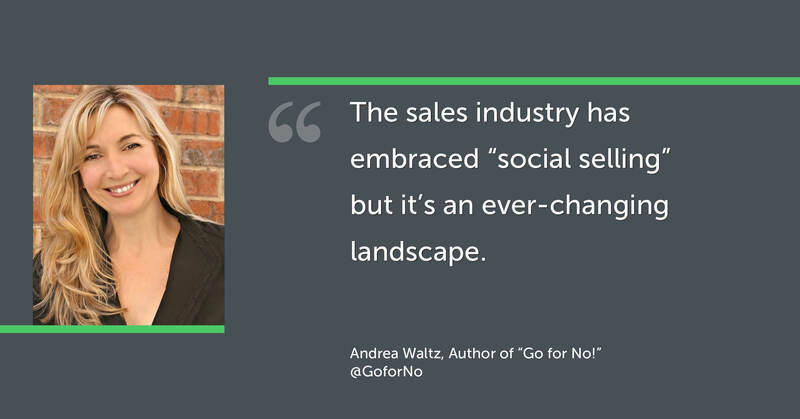 Andrea: I think most notable in 2016 was the continued focus on “social selling,” and what that looks like in the daily lives of sellers. A few years ago, social media was met with skepticism and a “wait and see” attitude. Now, the sales industry has embraced “social selling,” but it’s an ever-changing landscape. I think everyone agrees the buying landscape has been turned upside-down. So 2016 was a year of figuring out how sellers and sales managers need to change as a result of that. What’s the plan (finding leads, connecting, and creating content/building value)? That said, as many apps, social media platforms and hacks as we want to pile on the selling process, one thing will also hold true next year - continuing to build a culture in the sales industry that is based around flexibility and having a growth mindset - those things will always be needed to be successful in sales, in 2017 and beyond. Matt: Despite numerous calls for the imminent demise of sales, it’s still here and going strong! Yes, leading sales organizations have evolved their approach, their message, their structure. 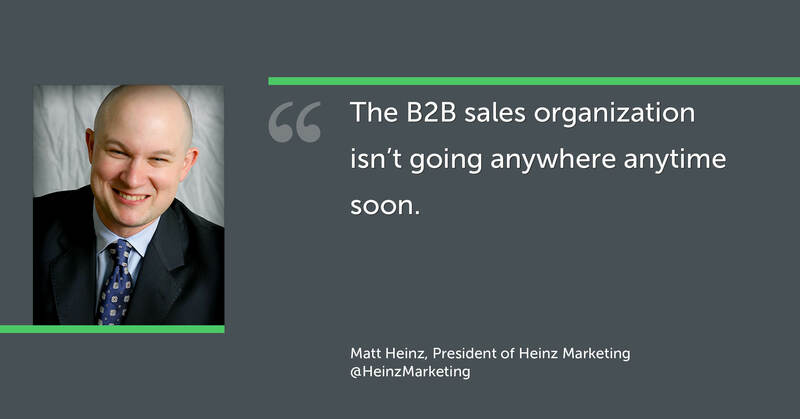 But the B2B sales organization isn’t going anywhere anytime soon. Matt: More alignment with marketing, more focus on an integrated, customer-centric story that starts with establishing need and works to build consensus among the internal buying committee. As selling gets more complicated and prospects get more time-constrained, successful selling will require greater integration with marketing and greater focus on full lifecycle selling than ever before. Greta: The sales industry has taken an interesting turn in the last few years. Corporations feel that social media is the way to sell today. This is certainly less expensive than more traditional marketing, so companies are relying on this new tool. Social media is an important part of marketing your products and services, but it will not replace the sales interaction of two people to get the job done and take it to the finish line. 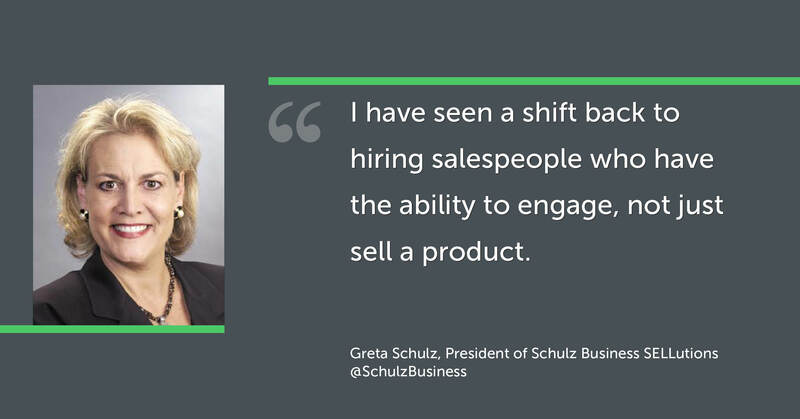 Greta: Since selling is typically something that happens between people and not computers, more people are starting to realize this, and put effort back into truly creating a consultative environment for their salespeople to sell. I have seen a shift back to hiring salespeople who have knowledge in an industry to create the ability to engage, and not just sell a product. They are spending more time and effort on tools to hire the right people and not just working off of a resume. True assessments will uncover things like if a salesperson will sell, not just can sell. Mark: An increasing awareness as to the quality of a lead versus quantity. 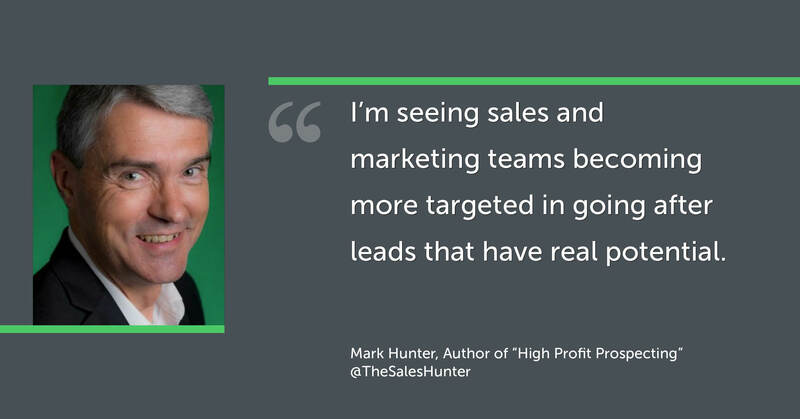 Too much emphasis was being placed on getting leads regardless of the quality, and I’m seeing sales and marketing teams becoming more and more targeted in going after leads that have real potential. Mark: This might sound strange, but I see a real push to creating more one-to-one dialogue. The cost of customer acquisition continues to be a huge issue and I see companies realizing the way to lower this cost is by doing what seems counter-intuitive – and that is to be far more customer-centric by having more one-to-one customer conversations. Elinor: The term "sales enablement" saw widespread usage in 2016. Startups model the concept by providing open work spaces for all departments to communicate with one another versus the old separated offices. The realization hit that, when Human Resources hiring practices transfer to combining the company brand, branding, marketing, communications, and public relations efforts, companies experience sales enablement on multiple levels with an improved bottom-line. 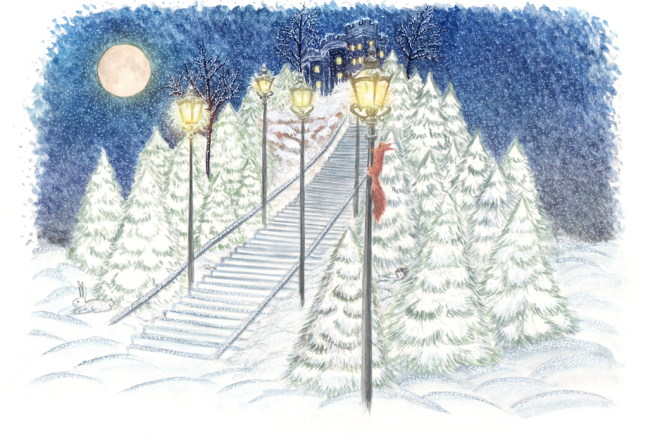 Elinor: Many companies dragged their heels adapting to the wonders of social media possibility. Microsoft's recent purchase of LinkedIn models the importance and likelihood of encouraging companies to allow corporate usage of these platforms. 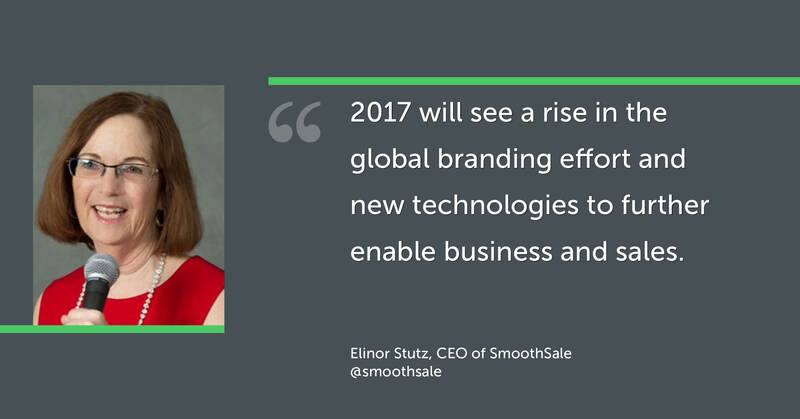 2017 will see a rise in the global branding effort and new technologies to further enable business and sales. 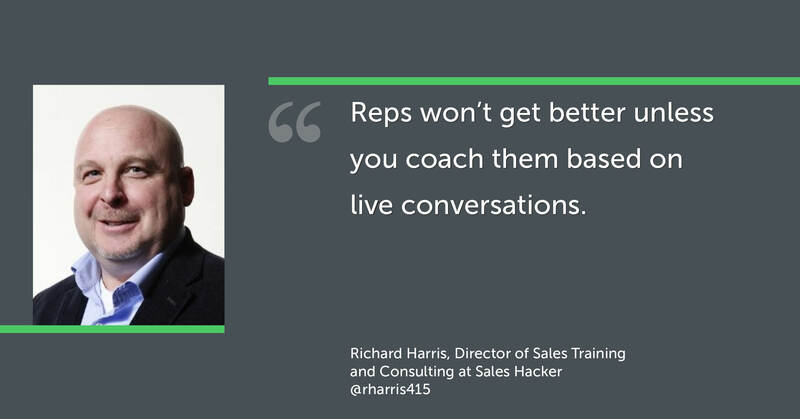 Richard Harris, Owner of the Harris Consulting Group and Director of Sales Training at Sales Hacker, Inc.
Richard: People are understanding the difference between efficiency and effectiveness. They are understanding that much of the efficiency is now table stakes; you've got to have those tools, whatever they are, but just because you have the tools doesn't mean the reps are going to have better conversations. I see more people gravitating to that. I'm also still shocked by the people who haven't accepted this reality. Richard: It's going to be about effectiveness. It's still going to be focused on understanding that no matter what you do, reps won't get better unless you coach them based on live conversations. You can do all the other stuff you want around sales, but unless you're giving them feedback to help them improve, either through technology or one-on-ones, you're going to fail miserably. I think the people who are going to be successful will embrace this. 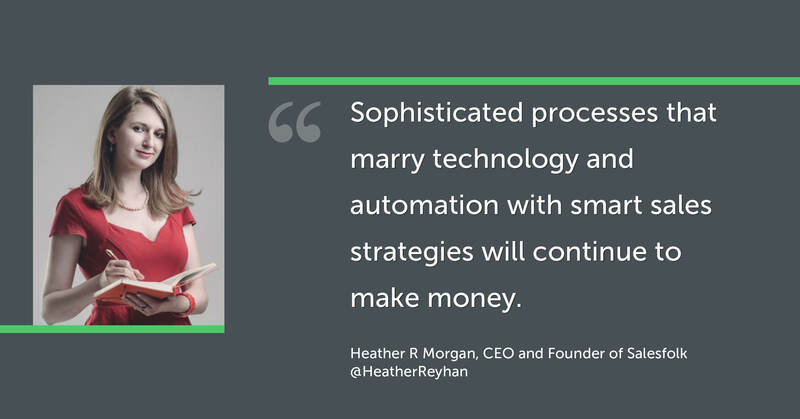 Heather: The biggest trend I noticed in the sales industry was a dramatic increase in the number of sales tech companies and tools in the market. While only a few years ago sales tech tools were sparse and that market was in its infancy, every week it seems like there are a dozen more tools doing the same thing. However, there are still no clear winners in the market. Heather: In 2017, many sales tech companies will die out due to increased competition in a market that is still small and not fully matured. However, the sales organizations that have sophisticated processes that marry technology and automation with smart sales strategies will continue to make even more money than ever before, while those who have fallen behind will continue to miss out on even more opportunities. Without a doubt, 2016 has been a year defined by technological sales tools, but they are just that — tools. As we move into 2017, sales organizations are coming to grips with the fact that substituting technology for essential sales activities isn’t a recipe for success. Human interaction and meaningful relationships — between reps and prospects, between managers and salespeople, between the sales team and the marketing team — will always be key ingredients in the special sauce that makes sales happen. Mix that together with the right sales technology and you and your team will be set up for success.